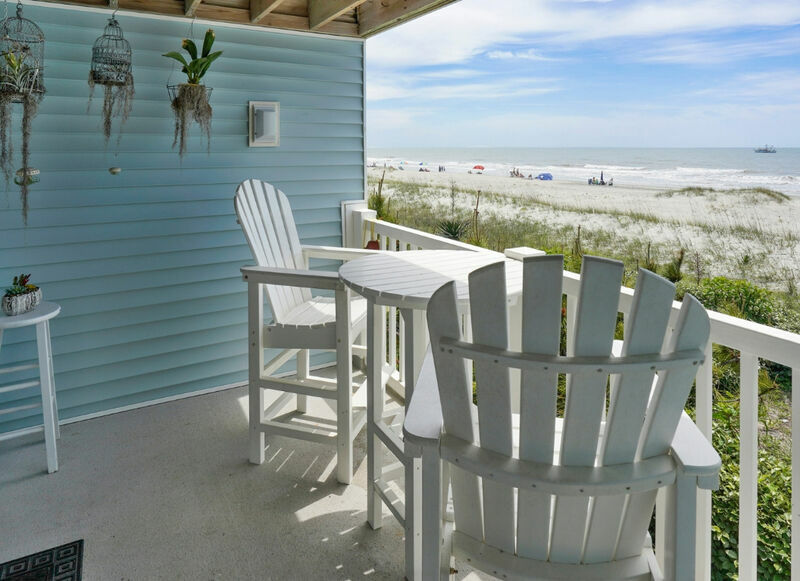 Watch the ever-changing ocean from the front porch of this cozy 1.5 bedroom condo. Total gut- renovation in 2015 by a custom designer/builder. Carbonized bamboo floors throughout with ultra-modern tile in both bathrooms. Quartz counter-tops with floating bar. Dining for up to six. Ceiling fans throughout. Ceramic top range. Double door refrigerator with bottom freezer. Farm sink. Three smart TVs with Netflix, high speed cable internet, and a work station with printer for the bit of work brought from home. This one-of-a kind-unit was originally built as a one bedroom, but now feels like a two bedroom by closing off the TV/sitting room with two pocket doors and popping down the double bed futon. With the adjacent main bath, this area feels like being on a Pullman sleeper on a train. The master bedroom has its own private half bath. The custom/free form entertainment center in the living room is fun central. It houses a TV and components. Fire up the fireplace for a January feel anytime (you won't believe it's electric). Puzzles, games and other stuff in the wicker baskets. Bookshelves stocked with beach reading. If you don't finish a book take it home or leave one for the next guest. Located on the first floor (walk up), this corner/end unit is at the very private end of the complex. Enjoy your coffee/tea (or glass of wine, anytime) from the "paradise porch". It has some of the best ocean views in Ocean Cove and offers sun or shade. A few steps from the porch and you will be at the pool, spa or beach. Walk a short block to the pier, surf gear, eats and treats. More family fun? See the municipal playground, mini-golf, and the Museum of Coastal Carolina - all across the street. All bed and bath linens provided with beds made upon your arrival! Sleeps 4. Queen & Double Futon. All bed and bath linens provided with beds made up for your arrival. Owner will accept 3 to 4 day rentals from 9/8-12/31. Monthly rentals are available at $999 per month in Jan, Feb, Mar. OC101 is our favorite condo at Ocean Cove. We've been vacationing at OIB for over 30 years and have stayed at a lot of places, so I think that it says a lot for a place to be our favorite. So, why is is our favorite? OC101 is clean. It has been recently updated. It is on the end of Ocean Cove so it is private. We can tell that the owners well maintain OC101. We've stayed at OC101 multiple times and we always check to see if it's available when planning our OIB vacation. Quaint, open, love the location and amenities. Quiet at the end of the building. A few small issues on arrival were resolved quickly. Upstairs unit was a bit noisy as their floor was our ceiling but over all good stay. Love OIB and enjoyed our stay at this condo. Will return.